Vanity Fair has the Twilight article now on their site. You can also see a behind-the-scenes video of the photoshoot here! They also have a Q&A with Rob and Kristen! 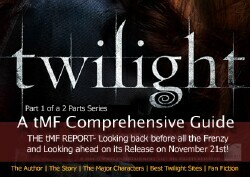 As part of the final installment of the Movie Fanatic’s Twilight Guide, the website concludes with an article on the fandom. The Movie Fanatic is featuring Robert Pattinson as one of the young actors with the most anticipated roles. LATimesBlog.com has posted some of the fan reactions to Stepehenie Meyer’s announcemen regarding the Midnight Sun leak. To share your thoughts, click here! Log in | 70 queries. 1.053 seconds.